Chrissy Metz, the breakout star of the weeper hit This Is Us, is coming to Clearwater on Monday to talk about her new memoir This Is Me: Loving the Person You Are Today. But first can we talk about her theories on fashion? Or rather, let's talk about her plea to abandon so-called fashion rules. You can read about her book and her Clearwater appearance here , where she talks about the pain of growing up in Gainesville, abandoned by an absent father and ridiculed by an abusive stepfather. She sprinkles it with a lot of advice on how she learned to love herself "as is." (And not waiting till later when you lose weight or get the degree or the promotion). She has a whole chapter devoted to fashion and how she weathers criticism. As a multiple Emmy and Golden Globe nominee, she is busy during awards season and finds the snarky comments on her dresses irritating. "The fact that it's even a discussion is frustrating because we are being told what looks good and what to wear," she said to me in a telephone interview this week. "How about just caring about what you feel like in the clothing? As opposed to wearing it for someone else." 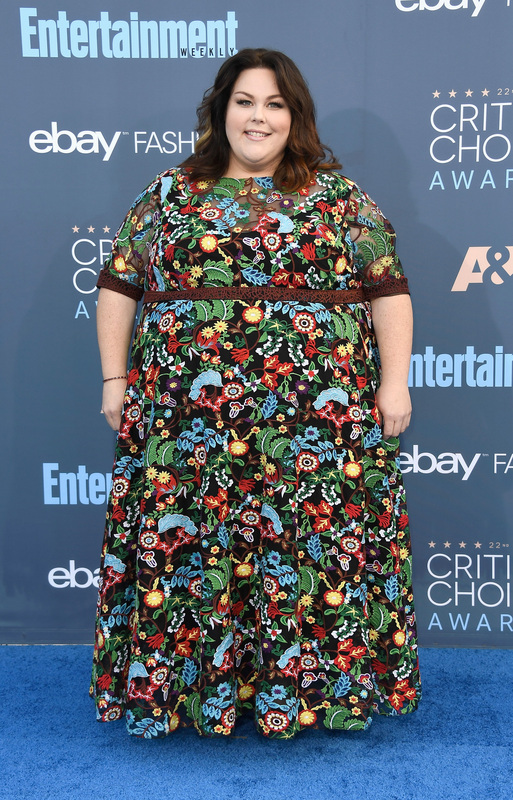 So here are 5 fierce fashion choices that Chrissy Metz has put out there over the last two awards seasons and what she was thinking when she made them. For her first Emmy Award nomination in 2017 she "wanted it to be dramatic to honor the night" so she chose a deep sea green. To make it stand out, designer Lela Rose embellished the gown with two rows of pearls complemented by crystals all over the bottom. "I was reminded that it doesn't matter what size you are, it's how you feel about yourself. Confidence, like beauty, is an inside job." Then she rocked a bright burgundy Latex dress at last year's MTV Movie Awards and said she hoped "an unconventional body wearing an unconventional material" opened up a discussion about how fashion is talked about. 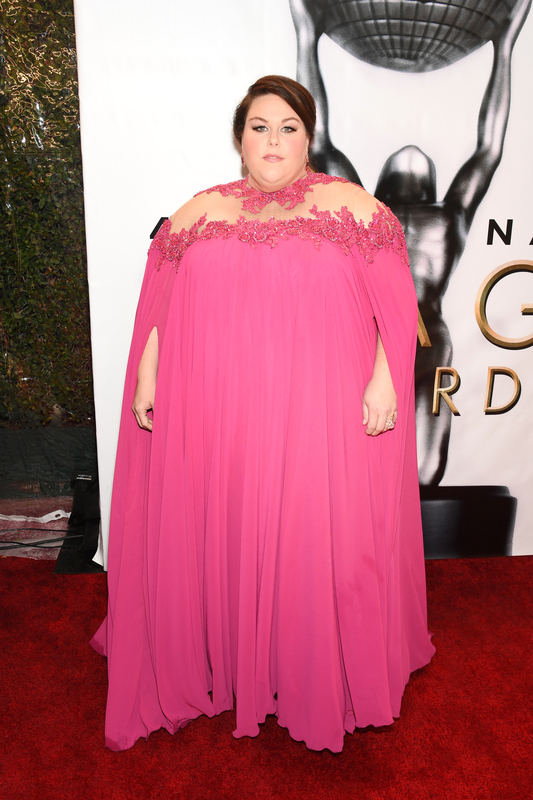 She won't be confined to the rules for large women to "only wear black." She embraces wearing bold colors, prints and fabrics. For the January 2017 Critics' Choice Awards, Metz fell in love with this intricate fabric of beautiful embroidered flowers. "Being a big girl, you want to hide sometimes but with that dress, it was like, 'Boom! I'm here, in all my embroidered glory.' "
Her advice: "You can't control how it is received or how someone interprets it. But by trusting your instincts and doing what you want, you then educate people about doing the same thing." But even her own mother questioned this beautiful bubblegum-colored number, below, by Michael Costello. She wore it to the NAACP Image Awards last year. Her mother didn't think it was flattering. "That dress was about celebrating living by my own rules," she writes. "I loved it." 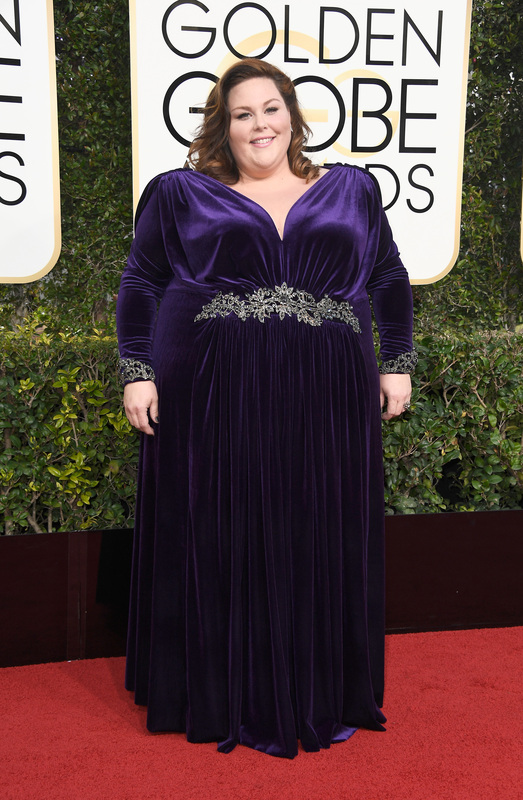 At the Golden Globes in 2017 she loved how regal this purple dress by Nathan Paul looked, even though one stylist questioned why she would want to look "wider" with that broad shoulder design. Metz dismissed the notion. "That powerful statement shoulder made me want to stand up straight and own my space." Her fashion rules are these: There are no rules. She rejects the notion of covered arms and avoiding horizontal stripes or anything too tight or all the other "musts" for big girls. Wear what makes you happy and ignore the shamers. "I've never been a part of the norm so it's normal for me to be out of the norm."